“What happens in Vegas, stays in Vegas.” While this may be the code to live by when visiting the City of Lights, the AHCA/NCAL 2011 Convention was just too great to not share with the rest of you who were unable to attend this year. It was a fantastic convention where we celebrated our successes while also preparing for our future. I had the opportunity to meet with each of our constituency groups to talk about the challenges we have moving forward, and how we must work together to face this uncertain future for our profession. The entire week was highly productive, empowering and moving. But two moments stood out especially for me: the acceptance speeches of our Developmental Disabilities (DD) Hero of the Year, Beth Atkinson, and Mary Ousley, recipient of the Friend of Quality Award. Day 2 of the AHCA/NCAL Convention and Expo brought a full day of multiple educational offerings, multiple messages and multiple chances to have fun. The education sessions had an early start as hundreds of providers took advantage of countless opportunities to earn CEUs. While there were certainly too many great sessions to count, of particular interest was a breakout session on using social media for advocacy. Experts were on hand to highlight the latest trends in consumer use of sites like Facebook, Twitter and YouTube and staff members shared tips and insights on how AHCA/NCAL is using social media for advocacy. Download our tip sheet to see how we’re using social media. The Opening General Session kicked off with a number of highlights and information on what AHCA/NCAL is doing to make sure that our message is heard and our public image in intact. President and CEO Governor Mark Parkinson reviewed the past year, highlighting the “ups” like improvements in quality indicators and the “downs,” such as the recent 11.1 percent SNF PPS cut that begins next month. With Tom Petty’s “Won’t Back Down” playing in the background, attendees got on their feet and cheered as Parkinson encouraged all to not back down in the face of adversity and tell their story to Members of Congress and the media. To see all this year’s highlights, watch the AHCA/NCAL Public Affairs Video. AHCA Board of Governors Chair Bob Van Dyk reviewed the findings of the association’s Public Education and Communications Campaign, (PECC) which seeks to change perceptions about skilled nursing care. Attendees got a first hand look at a series of educational commercials and were also directed to the campaign’s future website, Careconversations.org. Attendees then heard from best selling author Daniel Pink, who delivered a great message on human motivation through his latest book, DRIVE: The Surprising Truth About What Motivates Us. The AHCA/NCAL PAC fired up the night at Mandalay Bay beach with great food, great music and lots of excitement. Attendees danced the night away to Jimmy Buffet-style music and some quality time with friends. Were you at the AHCA/NCAL Convention today? Tell us what you thought. The AHCA/NCAL 62nd Convention & Expo kicked off with a bang on Sunday with a number of activities that kept attendees bustling around the halls of Mandalay Bay. Both NCAL Day and DD Day had a full agenda of general meetings, education sessions and a leadership training for not for profits. 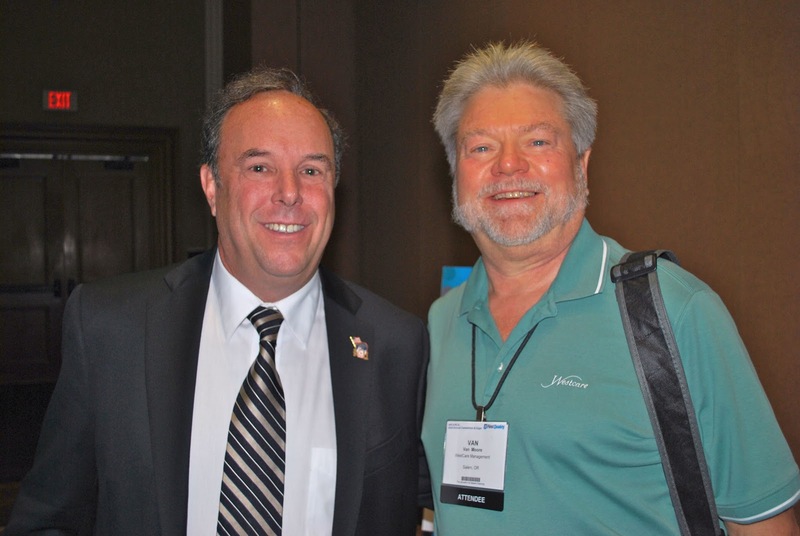 Early birds attending the NCAL opening session heard from Chief Richard Picciotto, the highest ranking firefighter to survive the World Trade Center attacks on 9/11. He detailed how he walked out of the collapse of the Trade Center towers and left the audience with the message that we all need to be united. The NCAL education sessions provided a great opportunity for assisted living providers to learn about the latest and greatest in culture change, leadership and customer service. Of note was "New Media and Older Adults: Bridging the Gap" session, which stressed that, when it comes to social media, everyone is doing it, just at different speeds. Futhermore, having an online strategy to engage older audiences is essential to staying relevant into today's 24 hour internet age. Attendees received a special treat while enjoying a delicious lunch during the NCAL Awards Ceremony. The best and brightest in assisted living received a special salute and delivered heartwarming remarks that inspired all. Ross Shafer, author of "Nobody Moved Your Cheese," entertained and invigorated the crowd at the NCAL closing general session. He challenged providers to stay creative in today’s unstable economic environment by serving today’s “on demand” customer. “If you don’t like change, you’ll hate extinction,” said Ross, as he shared practical tips to staying on top of consumer culture by staying focused, nimble and concentrated. While today was mostly a set up day for exhibitors, tomorrow the Expo Hall will be buzzing with fun activities and cool giveaways. Be sure to check out the Expo Hall when it opens at 11:30AM with lunch. Don't forget to tweet about your Convention experiences using the official hashtag #ltc11. Every day, care providers go to work with care, compassion and an eye toward quality. AHCA/NCAL proudly recognizes that commitment and all those who serve others in long term care, post-acute care, assisted living and other settings. So it’s only appropriate that each year we take time to honor those who stand out from the rest. To meet our profession’s heroes in person, be sure to attend the Closing General Session and Awards Ceremony on September 21st. 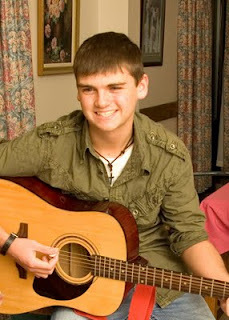 You’ll also hear a great music performance from our Young Adult Volunteer of the Year, Braden Stover. He is an avid country singer and songwriter who often performs at Clarksburg Nursing & Rehabilitation Center, where he volunteers several times per week. Participants will have a chance to catch up on all of the transitions taking place on Capitol Hill, with the administration and at AHCA/NCAL during the Opening General Session. New York Times Best-Selling Author, Daniel Pink will be on-site discussing his latest book, Drive: the Surprising Truth about What Motivates Us, which uses 50 years of behavioral science to overturn conventional wisdom about human motivation. Convention participants can meet Pink in person inside the Expo Hall at booth 1221 on September 19th at 1:00pm. If you’ve ever ordered shoes online, you’ve heard of the highly successful Zappos.com. During the Closing General Session on September 21st Zappos CEO Tony Hsieh will challenge providers to think about how a different kind of corporate culture is a powerful model for achieving success. Attendees will have multiple opportunities to learn more for industry experts. The 4 day event covers over 70 education sessions in 15 different tracks including culture change, care practice, survey and more. Back by popular demand is the regulatory MEGA Session, which will cover preventable hospitalizations, a hot topic in today’s health care discussion circles. And if you serve individuals with disabilities, attend “DD Day” on September 18 to learn about behavior management, ethics and best practices in DD settings, and medication management. The Expo Hall will be in full swing beginning September 20th. This year brings a new wave of “Meet up” sessions, where attendees can meet up informally and discuss topics like staffing, pain care education and electronic medical records. Follow AHCA/NCAL’s Twitterstream to be the first to know about giveaways and special events in the hall. And if you’re tweeting about Convention, be sure to use the hashtag #ltc11 so we know to follow you. If you’re attending Convention, we hope you’re ready to be invigorated and enlightened. LIVE tweeting and blogging from the Convention floor starts this Sunday, so stay tuned!